If It's Too Loud...: Bruiser and Bicycle - "The Train"
The latest single from Albany's Bruiser and Bicycle is an odd little offering that I'm becoming more and more obsessed with. "The Train" is a post-punk, almost shoegaze song, but with an organic, almost folk feel. But really accessible sounding while being experimental. The song starts off with a squall of high pitched guitar noise, but then a second, more palatable guitar comes in to join it. The vocals have a slight twang you don't normally associate with the Northeast, but it adds this endearing, melodic quality that helps pull the song together. "The Train" straddles the line between indie rock and folk perfectly without truly choosing sides. You can listen to "The Train" below. 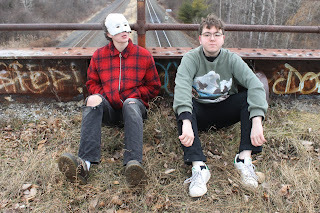 Bruiser and Bicycle's new album, Woods Come Find Me, will be out February 22 on Five Kill Records. You can pre-order the album here. For more on Bruiser and Bicycle, check out their website.